Like us on face book for daily fishing pictures and reports! 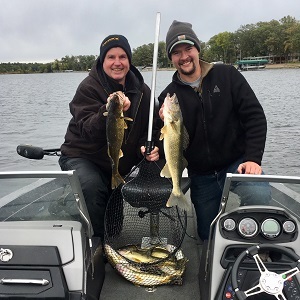 The location of early spring walleye in Brainerd, Minnesota depends largely on the timing of ice-out, or when the ice leaves the lakes. This typically occurs mid-April on most lakes in the Brainerd Lakes & Crosslake area. Later ice-outs can push the timing of the Brainerd, Minnesota walleye spawn back. Good Brainerd walleye lakes for these types of ice-out conditions include; Upper Gull, Margareta, Round, and Upper Whitefish. Walleye need shallow, gravel-bottomed, areas with current to spawn. The current can be caused by a river, creek, or predictable wave action. Key locations are rivers between lakes. The current keeps the gravel clean and ensures the walleye eggs will not silt over and suffocate. I like to fish these situations with a small, 1/8 oz to 1/4 oz, long-shanked ball-head walleye jig tipped with a spot-tail shiner minnow. I prefer jig colors like chartreuse and green. Cast the lure into a likely area. Let it settle to the bottom and slowly drag it in across the bottom, stopping from time to time to let it rest on the bottom. The walleye bite is usually a light steady pressure which slowly turns into a chewing sensation. I typically will tighten up on the walleye until I feel the dull throb of the fish shaking its head before I lower the rod, take up the slack, and then set the hook with a long sweeping motion of the rod. Fishing from an anchored boat will make this presentation even more effective. Don't work the jig too fast. Brainerd walleyes don't want fast presentations in these conditions. 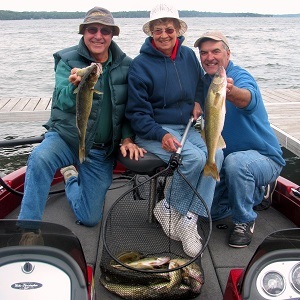 The walleye bite is usually a light chewing sensation. lite. Fish the lure slowly but don't fish the same location too long. Years of working as a Brainerd walleye fishing guide have taught me either the walleyes are in these locations thick or they're gone. Walleyes need rocks to spawn, but they sure don't eat them! The next locations to check are the sandy, slow tapering, breaks that have cabbage weeds. 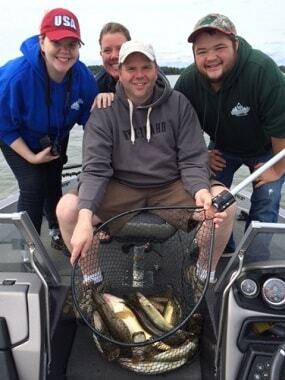 Good Brainerd walleye lakes for these conditions include; Gull, North Long, Round, and Middle Whitefish. The closer these spots are to known walleye spawning areas the better. Newly developing cabbage weeds are a must. 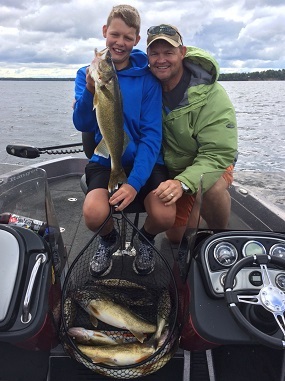 These spots produce the first good Brainerd Lakes walleye bite each spring. The typical water depths range from 12 to 18 feet. But on some of the clearer Brainerd lakes, this might be as deep as 24 feet. 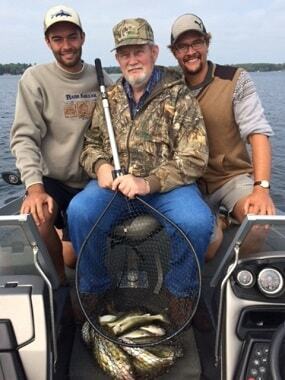 The sun's rays reach deeper and allow weeds to grow deeper, on these types of Brainerd lakes. Walleyes will relate to the weed edge during this period. My favorite technique for fishing Brainerd walleyes in these situations is live bait rigging. My favorite bait in is a small spot-tail shiner. I like to hook shiners lightly through one of their nostrils with a #4 hook. These delicate baits will last longer and swim livelier when hooked in this manner. 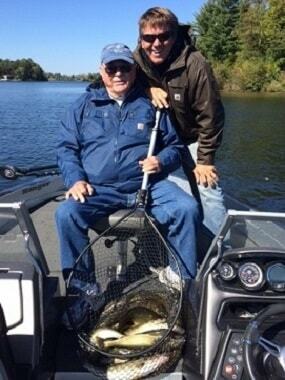 A 1/4 oz walking sinker with a 30 inch Snell has accounted for many limits of Brainerd walleyes in May.